After a four-year run in which a majority of news stories falsely linked the holiday season with an increase in suicide, more news stories last year debunked the holiday-suicide myth than supported it, according to an analysis by the Annenberg Public Policy Center. In reality, suicides tend to occur at the lowest rate during the holiday period from mid-November through January, according to data from the Centers for Disease Control and Prevention (CDC). But for years, many news and feature stories have endorsed the erroneous idea that suicide is more common around the holidays. The new analysis of news stories that connected the holidays with suicide found a decline in the persistence of that myth. Less than half of the stories (47 percent) in the 2014-2015 holiday season perpetuated that falsehood, down from 70 percent in the 2013-2014 season. The stories were gathered from the Nexis database. Despite the decline, the myth continues to appear in the news. There were 22 stories that supported the myth versus 25 stories debunking it in U.S. newspapers from mid-November 2014 through January 2015. The months of November and December typically have the lowest rate of daily suicides, with January sometimes reaching the annual average, according to statistics through 2013, the most recent available from the CDC’s National Center for Health Statistics (see Figure 2 below). The most daily U.S. suicides usually occur between April and August. In 2013, for example, the lowest daily suicide rates were for the months of November and December. The highest daily rates were in April and May. The policy center has been tracking press reports about suicide and the holidays since the 1999-2000 holiday season, when 77 percent of the stories supported the myth (Figure 1). From 2003 to 2009, the percentage of stories debunking the myth was usually higher than or equal to those perpetuating the myth. Since then, stories upholding the myth have again predominated press coverage. “Although many of the stories perpetuating the myth may have a benevolent intent, we’re concerned that making it appear that suicide is more likely over the holidays may inadvertently encourage those who are already considering it to go ahead with a plan,” Romer said. “Suicide reporting recommendations encourage news outlets to provide information that helps those in need of support to find it.” Those recommendations on media coverage of suicide can be found at www.reportingonsuicide.org. For the complete news release, including methodology and examples of false links between the holidays and suicide, click here. Figure 1. Percentage of stories supporting the myth vs. those debunking it. Excludes stories citing both in a coincidental manner (no causal association). Figure 2. 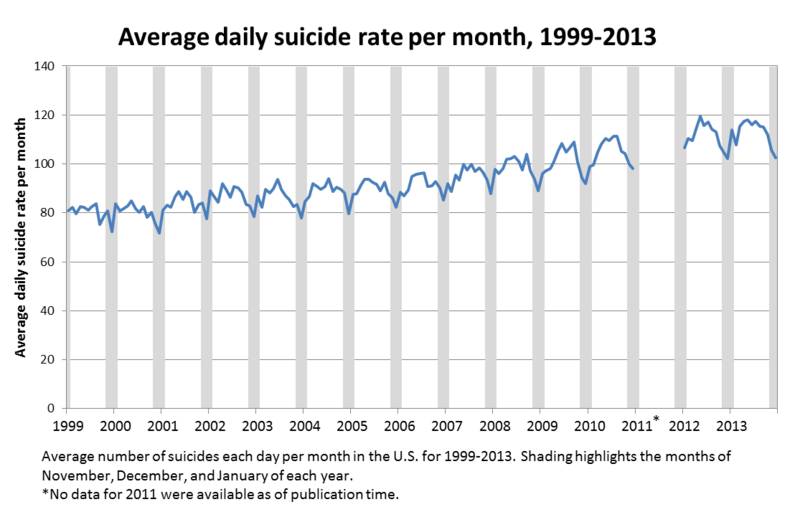 Average number of suicides per day in each month from January 1999 to December 2015. Data from November, December and January are shaded. Source: Centers for Disease Control and Prevention’s National Center for Health Statistics.